Numerous researchers warn of deleterious effects on soil fertility if crop residues are removed for bio-energy production (34-39). Removing more than 25% of cornstalks reduced productivity (38). Pyrolysis with biochar carbon sequestration provides a tool to combine sustainable soil management (carbon sequestration), and renewable energy production. While producing renewable energy from biomass, carbon sequestration, agricultural productivity, and environmental quality can be sustained and improved if the biomass is transferred to an inactive carbon pool and redistributed to agricultural fields. The uses of crop residues as potential energy source or to sequester carbon and improve soil quality can be complementary, not competing uses. The global amount of crop residue produced is estimated at 2.8 Gt per year for cereal crops and 3.8 Gt for 27 food crops. The use of crop residues for bioenergy could save 10-25% of fossil energy use (20). An enormous amount of biomass is burned each year without any use. Frequently biomass (forests, fallow vegetation, grassland, crop residues) is burned to get rid of it, adding CO2 to the atmosphere for only marginal and short term increases in soil fertility. Burning of biomass (slash and burn, crop residue burning) is a common practice, releases nearly all the carbon stored in the biomass immediately as CO2 and barely adds to carbon buildup in agricultural soils. Many agricultural systems search for alternatives to crop residue burning, because accumulating resi-dues can cause considerable crop management problems. E.g. increasing residue incorporation in flooded rice paddies causes higher CH4 emission, a very potent greenhouse gas. 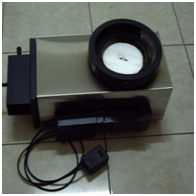 Other residues increase the risk of diseases and insect attack. Worldwide, the total carbon release from fire is of the order of 4-7 Gt of carbon per year. This flux is almost as large as the rate of fossil fuel consumption (Figure 2) (40). Tropical forest conversion is esti-mated to contribute globally as much as 25 % of the net CO2 emissions (Palm, et al., 2004). These num-bers emphasize the potential for biochar carbon management if only the biomass is utilized that is burnt for no other use than getting rid of it. Carbon capture and storage (CCS) usually assumes geo-sequestration (CO2 capture in depleted oil and gas fields, saline aquifers etc.) as the sequestering tool. To capture and store carbon as CO2 is very cost-intensive. These technologies require vast capital inputs and large scale projects. Using this technology for coal power plants can at best reduce its CO2 emissions, while using re-growing biomass would establish a carbon sink. Bio-energy with biochar carbon sequestration would capture a maximum of 50% of the carbon stored in the biomass but offers several environmental advantages. Bioenergy with biochar carbon storage facilitates the generation of carbon-negative energy (Figure 9 and 12). 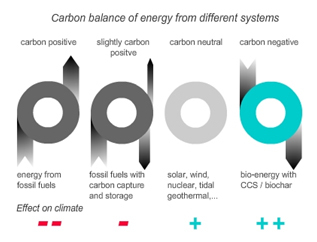 Figure 12 shows the carbon foodprint of different energy systems. Only bio-energy with carbon capture and storage or bio-char carbon sequestration can produce carbon negative energy i.e. if re-growing biomass is used, this system reduces CO2 from the atmosphere with each unit of energy produced. (www.biopact.com). Biochar producing gasifiers can have a broad range in size and in technological complexity. 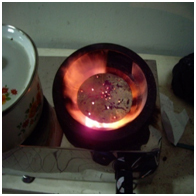 Bio-char can be produced as a byproduct from cooking (biochar producing kitchen stoves, Ropert Flanagan, personal communication, Figure 13). Decentralized small scale projects are feasible and large capital investments are not necessary. As biochar is a byproduct of gasification, no carbon capture technology is necessary. 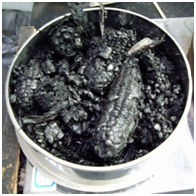 There is no risk of harmful CO2 leakage from biochar. Most scientists agree that the half life of biochar is in the range of centuries or millennia. From biomass to humus a considerable fraction of carbon is lost by respiratory processes, and also from humus to resistant soil carbon. Only 2-20% of the carbon added as above ground residues and root biomass enters the soil organic carbon pool by humification. The rest is converted to CO2 due to oxidation, and furthermore humus is not inert to oxidation (1). Soils can only sequester additional carbon until the maximum soil carbon capacity, or soil carbon saturation, is achieved, which requires a steady input of biomass and careful management practices. 80-90% of the carbon from crop residues in the field is lost due to decomposition in the first 5 to 10 years. In contrast, about 50% of the carbon can be captured if biomass is converted to biochar (26). The existence of Terra Preta proves that SOC enrichment beyond the maximum capacity is possible if done with a recalcitrant form of carbon such as biochar. These soils still contain large amounts of bio-char derived SOC in a climate favorable for decomposition, hundreds and thousands of years after they were abandoned. The carbon trading market holds the prospect to reduce or eliminate deforestation of primary forest, because cutting intact primary forest would reduce the farmer’s carbon credits. (41) estimated the above-ground biomass of unlogged forests to be 434 tons per hectare, about half of which is carbon. This carbon is lost if burned in a slash and burn scenario and lost to a high percentage (> 50%) if used for biochar production. Therefore, only re-growing plant biomass can establish a carbon sink. The carbon trade could provide an incentive to cease further deforestation; instead reforestation and recuperation of degraded land for fuel and food crops would gain magnitude. As tropical forests account for between 20 and 25% of the world terrestrial carbon reservoir (42), this would reduce emissions from tropical forest conversion which is estimated to contribute globally as much as 25 % of net CO2 emissions and up to 10 % of N2O emissions to the atmosphere (43). A prerequisite for the above mentioned management practices is access to the global carbon trade. According to (36) the global C market has a potential grow to $1 trillion by 2020 or before. This market must be made accessible to land managers, especially in the tropics where sustaining soil organic carbon and soil fertility is most challenging and CO2 emissions due to land use change are highest. One tone of biochar is roughly the equivalent of 3 tons CO2.